Social isolation has become a real problem for older people living within our communities – some can go days or even weeks without a meaningful social interaction. Bishop’s Close in Carlisle is run by Two Castles Housing Association and provides sheltered and supported housing for older people. Bishop’s Close Social Fund is run by volunteers and seeks to address this growing problem by establishing social events for both those living within Bishop’s Close and those within the wider community. 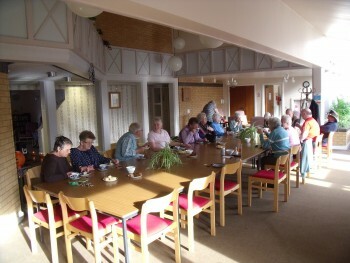 The group had already established regular outings and coffee mornings but wanted to develop its activities further by instituting a luncheon club. It was found that Sundays could be long and lonely da ys for many living at Bishop’s Close and as a result were ideally suited for the luncheon club. The club sought to reduce social isolation among the elderly and guarantee a hot meal on that day. Funding was acquired through the Kipling Fund for Older People and the Janetta Topsy Laidlaw Fund to run the club for twelve months. The luncheon club has been a resounding success and even those who have not previously participated in other events have enjoyed the experience and have forged valuable friendships.